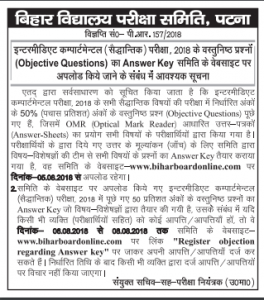 Latest update 20 August 2018- The Bihar Board will be declared BSEB 12th Compartment Result on 20 August 2018 on biharboard.ac.in The Candidates can check Bihar Board XII Class Supplementary Result on today. latest update: The Bihar Board will be declared BSEB 12th Arts commerce Science Compartment Result 2018 in the official website available soon on five days. BSEB has changed the dates for the Supplementary exams. Earlier, the exams were going to be conducted from 4 June to 7 June 2018. But now the dates have been shifted to July 13 to July 20, 2018. The compartmental exams will be conducted for the students who could not be passed in one or two subjects. The Board will be Provided BSEB 12th Compartment Result in the month of August Second week 2018 in the official web portal. So the Students can check Bihar board Intermediate Supply Result Subject wise in the official web page.